Beyond the Aesthetic and the Anti-Aesthetic (The Stone Art Theory Institutes) (Volume 4) est le grand livre que vous voulez. Ce beau livre est créé par . En fait, le livre a 248 pages. The Beyond the Aesthetic and the Anti-Aesthetic (The Stone Art Theory Institutes) (Volume 4) est libéré par la fabrication de Penn State University Press. Vous pouvez consulter en ligne avec Beyond the Aesthetic and the Anti-Aesthetic (The Stone Art Theory Institutes) (Volume 4) étape facile. Toutefois, si vous désirez garder pour ordinateur portable, vous pouvez Beyond the Aesthetic and the Anti-Aesthetic (The Stone Art Theory Institutes) (Volume 4) sauver maintenant. Each of the five volumes in the Stone Art Theory Institutes series, and the seminars on which they are based, brings together a range of scholars who are not always directly familiar with one another’s work. The outcome of each of these convergences is an extensive and “unpredictable conversation” on knotty and provocative issues about art. 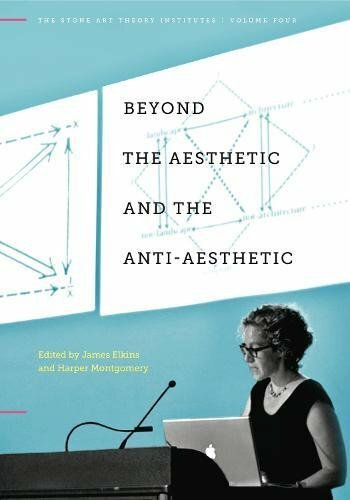 This fourth volume in the series, Beyond the Aesthetic and the Anti-Aesthetic, focuses on questions revolving around the concepts of the aesthetic, the anti-aesthetic, and the political. The book is about the fact that now, almost thirty years after Hal Foster defined the anti-aesthetic, there is still no viable alternative to the dichotomy between aesthetics and anti- or nonaesthetic art. The impasse is made more difficult by the proliferation of identity politics, and it is made less negotiable by the hegemony of anti-aesthetics in academic discourse on art. The central question of this book is whether artists and academicians are free of this choice in practice, in pedagogy, and in theory. The contributors are Stéphanie Benzaquen, J. M. Bernstein, Karen Busk-Jepsen, Luis Camnitzer, Diarmuid Costello, Joana Cunha Leal, Angela Dimitrakaki, Alexander Dumbadze, T. Brandon Evans, Geng Youzhuang, Boris Groys, Beáta Hock, Gordon Hughes, Michael Kelly, Grant Kester, Meredith Kooi, Cary Levine, Sunil Manghani, William Mazzarella, Justin McKeown, Andrew McNamara, Eve Meltzer, Nadja Millner-Larsen, Maria Filomena Molder, Carrie Noland, Gary Peters, Aaron Richmond, Lauren Ross, Toni Ross, Eva Schürmann, Gregory Sholette, Noah Simblist, Jon Simons, Robert Storr, Martin Sundberg, Timotheus Vermeulen, and Rebecca Zorach.